I wanted to give you a quick update on our trip back to the states so that we can see as many of you as possible. We fly into Charlotte, NC on September 20th and will drive down to Columbia that evening. We plan on being at Northside Baptist (SC) on Sunday the 23rd. We also have the opportunity to share with a church in Batesburg on Wednesday evening. 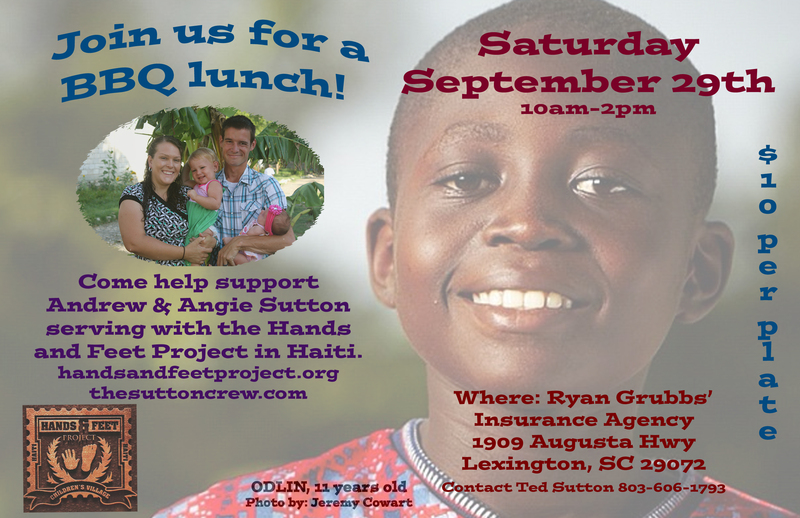 The following Saturday (29th) we will have a Hands and Feet fundraiser BBQ in Lexington (from 10am-2pm) for those of you that would like to join us. We would love to see you guys out there to share with you about what God's doing here in Grand Goave firsthand. See the attached flyer for details :-). Later on that evening we will be heading up to visit some good friends of ours in NC. We will then attend church with them that morning and make our way north that afternoon to Syracuse. We will be doing lots of wedding preparations that week before the wedding on October 5th. That next Sunday (Oct 7th) we will be worshipping with our church family at Northside Baptist (NY) followed by an evening service at RiverEdge. We are really looking forward to catching up with lots of friends and family over these next two weeks! Please be praying for safe and easy travels (this will be a first for us with two infants in laps). Praise the Lord we don't live half way across the world and have to fly for more than 2 hours at a time :-). You can also be praying for our time spent with our family and friends- that it would be a sweet time of re-connection and encouragement. Friends and Family, I am sorry this update is LONG overdue! I apologize, I will put some more pictures in the next update, we haven’t had a lot of time to take pictures of what’s been going on lately. We have been staying extremely busy with our teams back to back since June 2nd. Praise the Lord that we’re almost done with this crazy hectic summer. Our last team leaves September 3rd, so after that, we will be back to normal. PLUS our kids go back to school the first week in September too- so we’re excited about having some time to rest and relax in the mornings :-). As some of you might have seen on Facebook, this past Friday one of our 6-year-old girls from Jacmel went to be with Jesus. They were taking a trip to the beach (like any other day) with some of the kids and a big wave came and swept her away. By the time they realized she was not in with the rest of group- it was too late, they were unable to find her. They did find her body several miles down the beach Sunday afternoon. Our heart breaks for those in Jacmel who are grieving the loss of this sweet little girl. But we can also rejoice in knowing that she is with our Lord right now and in a far better place. So today we (the Sutton’s) unfortunately, have our first funeral to attend here in Haiti. Please be praying for those who were close to Junette and that God of all comfort would give them His peace that passes all understanding. Please pray for Junette’s extended family too that is now grieving too. Pray that they would turn to Christ and come to know Him in a personal way. As soon as we heard the news, we immediately told our kids (and team) and had them start to pray for those over in Jacmel. Pastor Manyol led us in a time of prayer, song and reading of the Scripture. It was a sweet moment to see him step up like that and lead our kids. After that, Andrew and I sat down with half of the kids (one-on-one) and had a conversation about where they are spiritually. We shared with them James 4:14 (life is like a vapor, here one minute and gone the next.) It was pretty encouraging to sit down with them and find that each one professes to be a believer. On the other hand, the discouraging thing is that you’re just not sure how genuine it is, or if they’re just saying that to make us happy. We tried to explain that there’s a difference between knowing Christ in your head (along with all the church answers) and knowing Christ in a personal and intimate way. In that same conversation, we then, encouraged them to be reading the Scriptures daily and to be praying to God. When I was talking to our kids, it reminded me a little bit of the Bible belt- where a lot of people know the right things to say, but when it comes to living it out- it’s not real and authentic. Anyways, we are hoping to sit down with the rest of the kids sometime this week to find out where they are spiritually. If you could be praying for us as we have these conversations that they would be genuine and that we could really dig into the heart of the matter, that would be awesome! Pray that God would change their hearts in a way that only He can do and that He would change them from the inside out. Thank you so much!! We have some really exciting news about our well at the mountain property!! Blue Ridge came by this week to drill our well and they found about 15 gallons/min!!!! (To give you an idea of how excited we were, our last well on that property only produced about 3 GPM.) Praise the LORD! It was really neat, before they started drilling, we were able to pray both in English and Creole. The neat thing about it was that there were lots of neighbors around and were able to join us as we began drilling for water. We now have the green light from HAF to get started building our foundation for the permanent structure at the mountain property, Ikondo. What a HUGE answer to prayer :-). Summer (and help) is Here! The kids are officially done with school and are enjoying their summer vacation! We have two interns who have joined us to help with teams and activities for the kids during our summer months. Lauren is a VT graduate, who majored in art and is helping our kids make projects this summer to sell to our groups. They have made some really cool things so far including necklaces out of rocks found on the beach and some different types of Haitian wall decorations. Our other intern, Myra, is here from CA to help us host our teams this summer. We are so excited to have some extra help around here- especially when we have so many short term teams coming in and out. Praise the Lord! Our team last week also helped us pour a little pad for a basketball court. Our kids are loving it (although, they're still learning the rules :-). The team we have here this week has a lot of youth in it- so it's perfect: the Americans whip the Haitians in bball while the Haitians kill the Americans in soccer. Wilson has successfully finished his first round of chemo two weeks ago. So far, he has not had a whole lot of side effects from the meds- just some water retention. The most exciting thing- is that they actually allowed him to come home for two weeks until he starts his next round!! He was so excited that they allowed him to do that. Especially because they were really hesitant at first- with a depressed immune system at an orphanage with 30 other kids- you're asking for an infection! But he's been staying in Michelle's house and wears a mask while outside- but it's so much better for him to be with his "family" than in the hospital. We're so thankful for that blessing. He goes back in tomorrow for his second round- please pray for him as he continues his treatments and for strength! The beginning of May started out with a 6 day trip to California for an Orphan Conference followed by some HAF board meetings. We learned a lot at this conference and were able to get some new ideas about how to better care for our children here. One of the big pushes at this conference was to create a "family style" environment for kids at an orphanage. The orphan movement is trying to move away from "institutions" and giving every kid a loving family. So we talked a lot that weekend about how that could look here in Haiti, where there is no Foster Care system and the adoption process is extremely difficult. Another huge issue we brainstormed at the conference is what to do with our older kids and helping them transition out into the real world once they're done with school. So we had lots of great conversations over the course of those few days together as a board and Haiti staff. Through a lot of discussion with our directors and prayer, we feel like we've got not only a great vision, but God's vision, for our kids here in Grand Goave. Since we have two sites here in Grand Goave (the current site we're at & the mountain property), we want to best utilize the space for our kids. SO the plan is to keep our current site a place where we have kids from 0-15 years old in a family style home, which would include having 6-8 kids in a small home with a "house parent(s)" where they can eat meals together and see what a family looks like. And the plan for the mountain property is to make it a "transitional home" for those over 16 as well as a guest house for teams. This way our older teens can continue to go to school in the mornings but also have the opportunity to learn a trade and work in the afternoons. This would be more or less like a college type environment for them- where they're getting ready to move out on their own while learning valuable skills to be able to use in the real world. We would love to be able to teach them various skills like welding, masonry, carpentry, farming and cooking (some very common jobs in Haiti). The other really neat thing about having teams up on this same property would be the potential to gear our teams towards teaching some of these skills to our teens for the week they're in Haiti. For example, it would be really neat if a team of welders came in and taught our kids for a week some basic techniques or skills. The plan is for Michelle to take care of the site where the younger kids are and we would be up on the mountain property with the older kids and teams. Andrew and I are really excited about this vision and really feel like God has given us a heart to teach and work with these kids in getting them ready to transition out into their culture. Our last team was from California and was our first returning team here in Grand Goave. It was really neat to see how excited the kids were to see some returning faces and how they remembered their names. The team helped us with a lot of welding and painting projects as well as just loving on the kids. One of the big projects for the week was to make a luggage rack for our big Deuce and a half. We are going to need some more space for luggage when we pick up bigger teams from the airport. So that was a huge help! Our next team doesn't come in until June 2nd. That's when the crazy summer begins :-). We will have teams here back to back from June 2 all the way up until the end of August- so when one team leaves on Saturday we pick another one up that same day. So you can definitely be praying for us as we look forward to a summer of craziness. 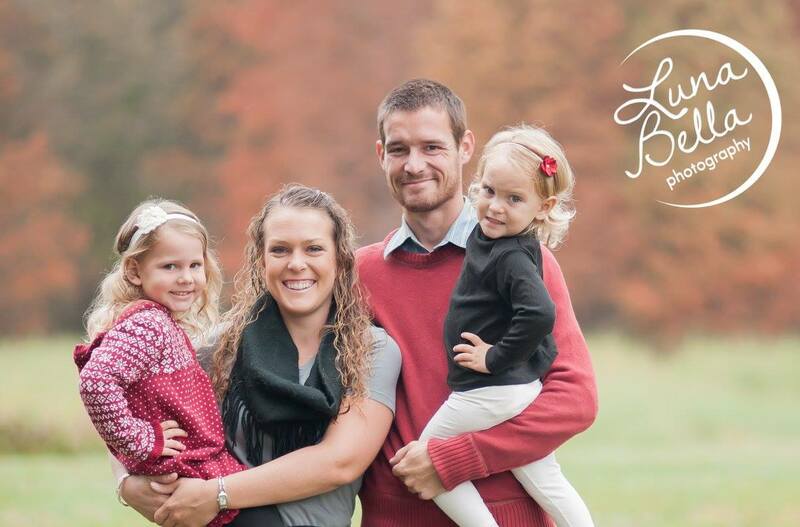 We're still anxiously awaiting the arrival of our little "Button Sutton." We are due June 14th, but I'm ready any day now to meet our little one :-). It is starting to warm up down here (low 90's- which feels like low 100's when you're pregnant with no A/C). Thankfully only a few more weeks and we'll be able to meet our little Sutton. Other than the heat, everything else looks great- mom and baby are healthy! It always blows my mind to be able to see so much detail of Baby's face with the ultrasound machine. Conference. Praise the Lord for a great time in CA of rejuvenation and time to connect with other members of HAF. Praise the Lord for the vision that he's given to us and our leadership on how to better raise these kids. What a great time of refreshment with others who are working in the same ministry as we are- orphan care. Devotion time with kids. Praise the Lord for our devotional times with the kids in the evenings. They are really enjoying it and some of them even asked to be baptized several weeks ago :-). We are so excited to be able to sit down one-on-one with some of them and talk through what it means to be baptized. It was really encouraging to our hearts, because they were the ones who brought up the subject!!! Wilson. Praise the Lord- we just got the biopsy results back! The bad news is that it is Hodgkin's Lymphoma. The good news is that it's one of the more treatable childhood cancers. So NOW we're trying to find a doctor (or group of doctors) that will take Wilson on as their charity case. We've got several avenues that people are pursuing for us- so please be praying that someone would be willing to take him on as their patient. Please be praying that God would open doors and that the paperwork and all the other details would just fall right into place for him to get some treatment soon! Well our past month has been packed full with visitors- family, friends and child sponsors. We had a great time with my sister and her fianceé along with a team from the US and Australia- lots of encouragement and help. They were able to paint the swing set, monkey bars, Faith's toy box and help us put up the chain link fence around the soccer field. The fence around the soccer field allows the neighbors to use the field, along with our kids, but not be inside the rest of our compound. The kids are back in school now and can I just tell you how nice it is to have them back in a routine?! Haha- three weeks of Spring Break, I think, is a little too long :-). We are sad to see our first intern, Joy, leave us tomorrow :-(. She has been a huge blessing and help around here the last few months. She fits right in here at Grand Goave. We will certainly miss her help with the depot, teams, the HAF store, watching Faith, doing my dishes as well as her ideas on how to better improve here at Hands and Feet!!! Thanks, Joy for all you've done these past three months- you will be missed!!! Mountain Property Update: Over the past month, we have been testing our well for about 10 hours a day to see how much water it really is producing. The good news is that it hasn't produced less than 2.8 gal/min. In testing the well, we are able to give out the water to the neighbors- who absolutely love not having to walk down the mountain to get it. GOSSIP. The Women's Conference had a really good turn out! I ended up sharing some Scriptures from James and Matthew about gossip and the power of the tongue. It wasn't a "feel-good" message, but one that needed to be addressed. After all, the Word of God cuts deep and convicts, right? I ended up sharing in English and the pastor's daughter translated for me- thank you, Alexis!!! Evening Devotions. Andrew's Bible lessons with the kids are going really well. They are loving the interaction and being able to answer questions! I'm pretty sure this is the first kind of interactive Bible study they've ever had. Most of the other studies they've had in the past are more of a teaching time- no room for questions and answers. Each of the kids also just got a brand new Creole Bible with their name engraved on it. It's really neat to see the enthusiasm of the kids when they read and can find the Scripture for themselves. Joy- We are going to miss you! May God bless you as you start a new chapter this fall! Orphan Summit: We are gearing up and getting ready for an Orphan Conference this May 2-8. We will be flying into California and attending the conference for two days followed by some HAF board meetings. We are really looking forward to some of the breakout sessions specifically geared towards discipling teenagers, transitioning them out of orphan care into the "real world," as well as family style model orphanages. Drex and Jo Stuart (previous HAF directors at the Jacmel site) are coming down to hold down the fort while we're gone. Our kids have been doing a great job of taking care of our new garden!! The Northside (NY) team helped us plant some corn, watermelon, beans, beets and some flowers. They are sprouting up and the kids are doing a great job at watering them everyday! Jean Baptiste and Jean Marie are the two who are really taking ownership of the garden- which is awesome! Andrew was outside working with some of the kids the other day helping them put together a little fence and irrigation system for the garden. It is definitely time for an update from the Sutton's in Grand Goave. I apologize for the delay in getting this to you. We have been enjoying a month full of visits from family and close friends. We have a group (or family friends) here with us back to back from March 18th-April 17th- so lots of visitors. We had a great time last week with a group from Northside Baptist (NY) lead by my parents. It was really good to get to spend some time with them. Their team was such a blessing. They brought so many supplies and came with lots of project ideas. They built a swing set, monkey bars, a climbing rock wall as well as a tight rope for the kids to play on. The kids have not stopped swinging and hanging on them since they were installed :-). They are absolutely loving it!!! They also made us some seat cushions for our Deuce, curtains for all of the kids rooms as well as teaching our girls how to sew a simple hem using a sewing machine. They donated two identical sewing machines for our girls, so they can learn how to sew. We also had a dental assistant on the team who worked with the kids and showed them how to properly brush and floss. So- a great week with lots of different skills and talents, all being used to serve! This week we have some really close SC college friends that are visiting this week to encourage us. They have made a few games for the kids (ladder ball, corn hole and a washer toss) as well as some other miscellaneous projects around. They have also been pampering us by cooking American dinners, doing our laundry, cleaning and whatever else needs to be done. It's been great having some much needed encouragement and fellowship with family friends. This upcoming Saturday, my sister and her fiancée come down to spend a week with us. We are looking forward to having some time to spend with them and showing them around our town. And then, the following week, we drop my sister and fiancée off at the airport and pick up another team. So we have lots of people coming to help out and check out our place in Grand Goave! Our kids have been spending the last week and a half taking their midterm exams. And because it is exam week, their schedules have been changed and they only go to school for the test- which means lots of extra little bodies running around in the morning. It has been great for the teams to have the kids around in the mornings, but a little hard to get some "Andrew and Angie" free time. We've also been struggling a little with some behavioral issues. We feel a little more like a troubled teen's home, lately, than an orphanage. The more we learn about these kids, the more baggage we're finding. Please pray that they would continue to open up to us, so that we can better understand where they're coming from. Another exciting thing going on this week is our church's annual Women's Conference. Just to give you a little taste of how things work in Haiti- I was sitting in the back of our church a few Sunday's ago watching Faith roaming around. I was listening to the announcements when all of a sudden Pastor Lex says in English, "Madanm Andrew (aka Angie), will be speaking at our women's conference coming up at the end of March." So I thought, he was just kidding, because he was speaking in English (and most of them wouldn't have understood it). But then, he said the same thing to the congregation in Creole. Then I knew he wasn't joking- SURPRISE! SO…..I am going to be speaking this Friday morning to a large group of women about gossip. Please pray that God would speak through me as we open up the Word to hear from Him about the sin of gossip. Pray that the Word would transform their hearts and attitudes as we dig into the heart of this topic. Pastor Lex encouraged me to do it in Creole, but I'm not sure I'm ready to do that yet, so I think I'm going to most of it in English. Please pray that as I prepare God would continue to reveal Himself to me and that He would give me the words He wants me to say. - Praise the Lord for a great visit and the time we get to spend with family and friends down here at our home :-). - Praise the Lord for His healing hand. We've been dealing with a few stomach bugs (yes, it's going around even in Haiti)- but it seemed to be short lived. - Thank you, Jesus for a great and healthy pregnancy so far. Baby is doing great and moving around a lot now! - As I mentioned before, please be praying for the Women's Conference this upcoming Friday, Saturday and Sunday. Pray that God would give me His words to share with these women and that their lives (and my life) would be transformed by the power of His Word. - Please be praying for our evening devotional times with the kids. Andrew is continuing to do an awesome job with that. The kids are really into it and excited to be able to have a chance to answer questions- something they don't get to do a lot in their church services. Pray that it would not just be a bunch of OT stories- but that they would really see how it connects and applies to their lives. - Our Thursday worship nights are going really well. For the first few weeks, I led it by myself. But last week we asked a few of our kids to help out- and they did an awesome job! It was neat to see the energy it brought by adding a drum set, bass and a microphone!! The kids really enjoyed it. It's still a blended service- English/Creole, which is an awesome thing to experience: singing to One Almighty God in two different languages. It gives you just a glimpse of what it will be like one day when every tribe and tongue is joined together before the throne singing to the One who is worthy!!! - Pray that we would continue to keep our marriage strong and in the Word as we have lots of guests over these next few weeks. Pray that we would be intentional in setting time aside to spend with each other. Thanks again for all your help and support! We couldn't do it without your prayers- and I mean that! We're finding out more than ever the importance and power of prayer, especially living here in Haiti with 31 kids. Thank you!!! !